Home » Columns » Gods, Resorts & President’s Rule ? We are blessed to have such benevolent leaders who are fighting so hard to get an opportunity to serve us! If you are not in this denial and have a sense of reality, then it is clear they are fighting to “rule” us, not serve us. They want to rule because a ruler takes what he wants from both the land and its people. But when citizens don’t vote, or vote based on caste and cash, how can we expect to have a visionary Statesman as our leader? Our politicians are a reflection of us. Our leaders, as a last resort, rush to Resorts. In 2004, when the JD(S) was trying to form the government after ditching the Congress, H.D. Kumaraswamy took his MLAs to a resort. In 2009, BJP leaders were ferried to Goa. In 2018, it’s Hyderabad. Now, apart from confining leaders to a resort there is news of abduction! What next? Elimination? Or run to Gods? Speaking of Gods, when B.S. Yeddyurappa’s kurchi was being shaken, he visited Kukke Subramanya temple and performed sarpadosha yaga, a puja to the Snake God who, according to a priest, had cursed the then Chief Minister. Looks like that puja didn’t work. Ten years later the Snake God is still upset with Yeddy, it seems. May be, Yeddy should do puja to H.D. Deve Gowda (HDD), who can grant him his wish of becoming CM. Oh! is HDD the real Snake God?! Remember, Lalu Prasad Yadav called him a “Cobra”? But later the same Lalu joined hands with HDD and when he was reminded that he had called HDD a cobra he replied, “A cobra is a source of strength. With him on our side, we’ll sting the Opposition.” Yes, HDD has the sting that every party needs today. Back in 2009, it was funny that while the then wobbly Chief Minister Yeddy ran to the Gods to make his kurchi more stable he had given up the Muzrai portfolio, the Ministry that cares for temples, because it is considered unlucky! 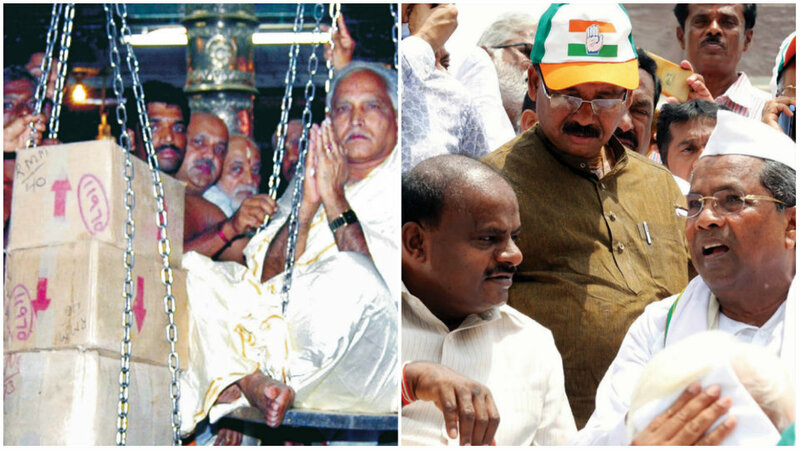 Ironic that while the CM wants the Gods to take care of him he did not want to take care of Gods’ temples. Now both the parties are praying for the same thing, and God is bound to disappoint one of them. So is God’s solution a re-election? Or is that what BJP wants? Because now that the image of the JD(S) has been tarnished and the desperation of the Congress has been furnished, is the BJP hoping the voters have been convinced? Convinced that BJP deserves their vote like in 2008. Today, as BJP is tested on the floor of the house, it has two options. Either it can try and bring down the halfway mark to 104 or 105 by ‘managing’ enough abstentions from the JD(S) and the Congress; or it can woo and bring at least seven MLAs over to its fold in order to reach the magic number of 112. If all attempts fail, the State would be brought under President’s Rule and a fresh election for the Assembly could be held very close to the general election. Ah! Four birds with one stone! One — if there is re-election, BJP has a better chance of winning because both the parties, JD(S) and Congress, are financially very weak to fight a re-election so soon after having fought a very expensive election. Two — Congress will be out of Karnataka too, which goes with the Congress-Mukt Bharat agenda of BJP. Three — JD(S) could slip into insignificance as now it’s a party that is tainted as one that cannot be trusted and is financially weak. Four — The general election will be too close after the re-election, which is advantage BJP. Even if JD(S) and Congress form the government, it is unlikely they will last the full term and elections will come early. If this happens, Amit Shah deserves to be called the ‘Chanakya’ and the ‘Shah’ of Indian Political Chess. Incidentally, he was the Chess Association President of Gujarat. Also by forcing Congress to approach the Supreme Court, where it got a favourable verdict, the BJP has not only proved that they cannot influence the Supreme Court but has also left the Congress, which wanted the Chief Justice impeached just a few weeks ago, embarrassed. Now while our leaders are busy between Gods and Resorts, how is the State functioning? Well, thanks to officers. Yes, that is why government officers and bureaucrats are so powerful — they run the State. Despite the political chaos in the State, our transportation is unaffected, there is water in our taps, garbage is being collected, and Government offices are functioning. That is why they are called the iron frame of Indian democracy. Now, no matter who wins, we lose. If the people of Karnataka did not learn from 2004 and 2009, we deserve to suffer irresponsible and erratic leaders. They say everything is fair in love and war. And these days politics is war. And war has collateral damage…we, the citizens, are that damage. GSSSIETW ties up with Kaaya Tech Inc.
70 Years after independence, the greediness to rule and make money are the indictment on the dirty politics that seem to pervade all over India. No where in the world, in Western countries, 2 parties come together without agreeing detailed programmes for the benefit of voters.The shambolic exhibition of hunger of power should shame the country as a whole. Having seen this kind of political dynamics for 2 decades, from 1950s-1970s, I am glad to be out of this country.